Before the battle of Djahy, Egypt has maintained the reputation of being one of the most powerful and richest kingdoms at the time which encouraged many foreign factions and various coalitions to attack it. One of those forces was the mysterious Sea people who attempted to invade numerous times during the reign of Ramses II and his Successor Merenptah but they were easily defeated because they weren’t powerful enough to face the powerful military forces of Egypt. But everything changed in the reign of Ramses III who saw them as a real threat to the future of Egypt as they grow more in number and power. The battle of Djahy took place during the new kingdom (1550-1070 BC), between the forces of Ramses III and the sea people. The sea people were famous for being naturally born raiders who attacked and destroyed many of the eastern empires and responsible for the downfall of various kingdoms like the Hittite, Mycenaeans, and Mitanni. The sea people origin is still an enigma and they were known for their advanced level of military strategy, ferocity, and organization as it shows on the temple walls of Ramses II in Medinet Habu. Everything started after the sea people attacked the city of Kadesh and then set their eyes on Egypt the home of valuables materials like gold, precious stones, and rich fertile land filled with countless crops. In 1178 BC, the sea forces started to move to the Egyptian borders but the army led by Ramses III was prepared for their attack in the district of Djahy. Despite the advance tactics and power of the sea people, they were no match for the Egyptian army. The battle was won by the Egyptians but the war wasn’t over. The sea people used their superior naval powers to attack Egypt by sea. they were expert seamen and had the most powerful ships, unlike the Egyptians. Ramses III understood the inferior level of his naval forces compared the ones of the sea people so came up with a genius cunning tactic of letting the ships of the enemy to sail in the Delta Nile river and used the highly more maneuverable ships of the Egyptians which are powered by both oars and sail to carry bowmen and use grappling hooks to capsize the enemy’s ships. The arrows were shot by the Egyptian bowmen from the ships and the banks of the Nile and the enemy’s ships inability to move or counter-attack because they were only armed by swords and spears which were no match to the vital arrows of the Egyptians, all led to their total defeat and destruction. The war was won by the Egyptians but the price was too steep as it had a very unfortunate effect on the Egyptians army that became very exhausted and the Egyptians treasury was drained, all these factors led to the weakening of Egypt which all led to the end of the glorious days of the new kingdom. 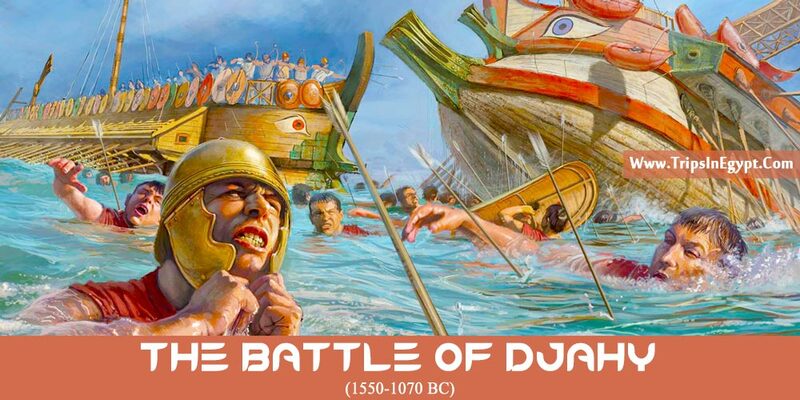 The battle of Djahy was a decisive moment in the history of ancient Egypt which defined the future of Egypt. Throughout history, Egypt has witnessed many battles which have sometimes fought to repel attacks by invaders and aggressors in defense of itself and at times to preserve the unity and cohesion of its territory and to prevent its fragmentation into small weak states, and to expand after some of its rulers aspired to enlarge the Egyptian empire. So, if you are fond of ancient Egyptian history and love for the exploration of everything that is mysterious and hidden from the Pharaohs era, then our Egypt tour packages offer special trips to magical sites of ancient Egypt with an Egyptologist tour guide, plus a magical Nile cruise to witness the beautiful sights of Egypt during relaxing on a luxury cruise between Luxor and Aswan.